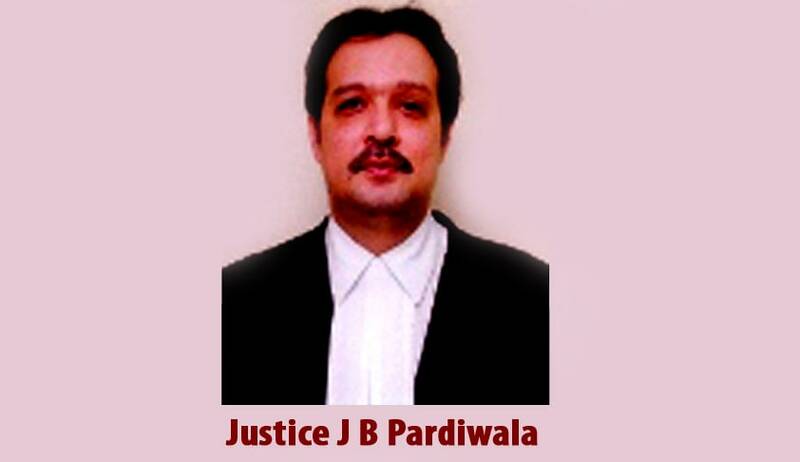 58 Rajya Sabha MPs have moved a petition, before the Chairman Hamid Ansari, seeking impeachment of Gujarat High Court Judge J B Pardiwala for his alleged "unconstitutional" remarks against reservation. The present controversy revolves around the observations made by Justice J B Pardiwala of Gujarat HC during a hearing on Hardik Patel. Gujarat High Court had quashed FIR lodged against Patidar Anamat Andolan Samiti (PAAS) convener Hardik Patel and others pertaining to charge that they were involved in an act of Treason (Waging war against the nation Section 121 IPC). Pardiwala had made the remarks on December 1 while quashing the charge of 'waging war against government' against Patel quota stir leader Hardik Patel and retaining the one of sedition. Justice JB Pardiwala, quashing the Treason case, said that an organized movement attended with violence while agitating for the inclusion of the Patidar/Patel Community in the list of the OBCs should not be viewed as an act of treason in the form of levying war. Read the Live Law story here. The members of Parliamentary Standing Committee on SC/ST at a meeting in Parliament House "condemned" the remarks by Justice J P Pardiwala and resolved to stage a protest in front of B R Ambedkar's statue on December 23. The meeting was attended among others by Union Ministers Ram Vilas Paswan and Thawar Chand Gehlot. Pardiwala had said, "If I am asked by anyone to name two things which have destroyed this country or rather has not allowed the country to progress in the right direction, then the same is reservation and corruption." The Petition said the Judge has also mentioned that "when our Constitution was framed, it was understood that the reservations would remain for a period of ten years, but unfortunately, it has continued even after 65 years of independence". The MPs said that the ten-year limit was prescribed for the political reservations ie representation to the SCs and STs in the Union and state legislatures, and not the reservation in the areas of education and employment. A minimum of 50 MPs are required to sign such a petition in Rajya Sabha, while in Lok Sabha the number is 100. The aggrieved members said the plea for impeachment would act as a deterrent for judges to not mix personal views with judicial work. There have been only two occasions in the past when Parliament has taken up such impeachment proceedings. In 2011, Justice Soumitra Sen resigned after the Rajya Sabha adopted the motion and sent it to the Lok Sabha to complete the process for his removal. In 1993, an impeachment move was started against Justice V Ramaswami but the motion failed.